To enrich something means to make it richer by adding good things to it. If you add some organic apple cider vinegar to your water, you've enriched it with enzymes and B vitamins. Enriched white flour must have lots of good things added to it, so it's good for you. Right? Not quite. 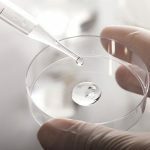 The reality is that many of the good things that were originally in the flour, like fiber and phytonutrients, have been stripped out through extensive chemical and mechanical processing. Processing removes 20 essential nutrients — a mere 5 are added to the finished product. 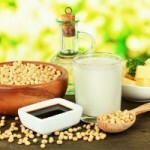 The added nutrients are iron, thiamine (B1), riboflavin (B2), niacin (b3), and folic acid (B9). But these aren’t natural vitamins and minerals added to the flour. The forms added to enriched processed flour are often created in labs or harvested from soil, rather than grown in nature. There’s a common misconception that enriched flour is not that bad for you, it’s just not as good for you as whole wheat. After all, the flour producer did add some nutrients back to it. 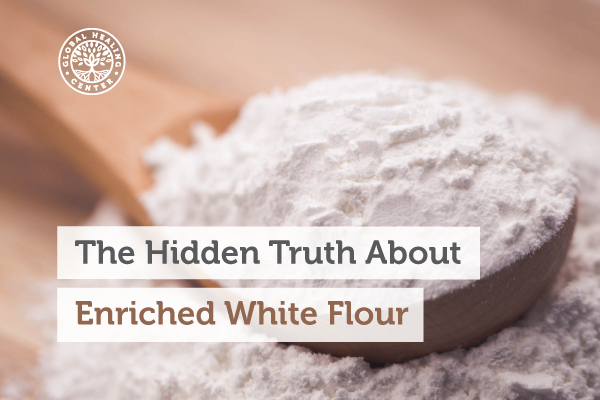 But this flour is not neutral — it’s actively harming your health. Consuming enriched flour products is like eating pure sugar and popping a multivitamin. What sets enriched white fiber apart from whole wheat fiber is which parts of the wheat berry make it into the flour. White flour has a very high glycemic index because it contains only the endosperm, or starchy component of the wheat berry. Whole wheat flour contains the whole wheat berry, including the bran, germ, and the endosperm. Whole grain foods are higher in fiber because the wheat germ and bran are still included. Whole grain foods have more nutrients than "enriched" foods. Whole grains are not absorbed like pure sugar, so they won’t spike your blood sugar. 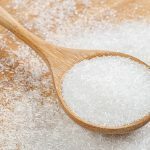 Many foods are made with flour of some type, and it’s not easy to go completely flour-free without switching to an all-produce, whole food, or raw food diet. Fortunately, there are many alternatives to enriched white flour if you’re not yet ready to switch to a flour-free diet. Try replacing enriched flour with whole wheat or rye flour. You could even try to go gluten-free. 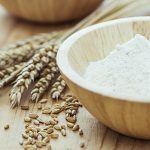 Oat flour, almond meal, chickpea meal, coconut flour, brown rice flour, or millet flour are all excellent gluten-free options with a wealth of health benefits. Pasta, bread, and baked goods are the foods that most commonly contain white flour, but pay attention to food labels — many processed and frozen foods also contain enriched flour. If available, organic, sprouted flours are best. Organic sprouted whole grain pastas and breads are much more common today than just a few years ago. Of course, the best diet plan would contain little to no processed grains and included more fresh fruits, nuts, seeds, legumes, and vegetables. You can also try incorporating enzymes, like proteases, to help your body break down the protein in flour. I personally recommend Veganzyme® to keep your digestive system functioning well when eating foods that contain gluten. Newby, P.K., et al. "Intake Of Whole Grains, Refined Grains, And Cereal Fiber Measured With 7-D Diet Records And Associations With Risk Factors For Chronic Disease." American Journal of Clinical Nutrition 86 (2007): 1745-1753. Web. 31 Mar. 2017. "Carbohydrates And Blood Sugar." Harvard Nutrition Source. N.p., 2017. Web. 31 Mar. 2017. Kolluru, Gopi Krishna, Shyamal C. Bir, and Christopher G. Kevil. "Endothelial Dysfunction And Diabetes: Effects On Angiogenesis, Vascular Remodeling, And Wound Healing." International Journal of Vascular Medicine 2012 (2012): 1-30. Web. 31 Mar. 2017. Steffen, L. M., et al. "Whole Grain Intake Is Associated With Lower Body Mass And Greater Insulin Sensitivity Among Adolescents." American Journal of Epidemiology 158.3 (2003): 243-250. Web. 31 Mar. 2017. Masters, R. C., et al. "Whole And Refined Grain Intakes Are Related To Inflammatory Protein Concentrations In Human Plasma." Journal of Nutrition 140.3 (2010): 587-594. Web. 31 Mar. 2017.